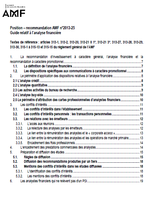 MEMOFIN - Draft technical standards under the Regulation No 648-2012 of the European Parliament and of the Council of 4 July 2012 on OTC Derivatives, CCPs and Trade Repositories - L'information financière que vous ne trouvez nulle part ailleurs ! The European Securities and Markets Authority (ESMA) has today published its technical standards on the Regulation on OTC derivatives, central counterparties and trade repositories (EMIR), which set out the specific details of how EMIR’s requirements are to be implemented. The EMIR framework aims to improve the functioning of OTC derivatives markets in the European Union (EU), by reducing risks via the use of central clearing and risk mitigation techniques, increasing transparency via trade repositories, and ensuring sound and resilient central counterparties (CCPs). “The publication of ESMA’s standards on EMIR sees the EU taking its final steps towards meeting the G20 commitment on bringing OTC derivatives trading under supervision, and provides clarity to the market on the shape of the new regime. The new regulatory framework reduces the risks arising from OTC derivatives trading by improving transparency in the sector and ensuring resilient central counterparties.